Provided photo Senior FFA member Lane Mergler, right, gives a “Life Saver” candy to senior Brookelyn Hermann for wearing her seatbelt. CASSTOWN — On Friday, Sept. 21, as part of National Farm Safety and Health Awareness Week, the Miami East-MVCTC FFA Chapter held a seatbelt awareness activity. As students exited the parking lot at Miami East High School, the drivers were stopped and their seatbelts were checked. All student drivers were inspected for wearing their seatbelt. They received a handful of “Life Saver” candies and reminded that, “Seatbelts are Life Savers.” Any student drivers or passengers not wearing their seatbelts were instructed to put on their seatbelt immediately. Results of the event proved that a majority of the drivers at Miami East High School do wear their seatbelt. Over 40 drivers and passengers were presented candy with 4.9 percent of drivers were not wearing their seatbelt. Similar results as were collected last spring when 3.8 percent of drivers were not wearing their seatbelt. The first seatbelt was in a Volvo vehicle in 1849. On February 15, 1885, the seatbelt patent was given to Edward J. Claghorn. By the 1930s doctors were requesting the vehicles be equipped with the restraining device. By the 1950s they were seen regularly in automobiles. And legislation in 1966-1968 made them mandatory for all cars. The FFA’s Safety Committee would like to encourage all drivers to slowdown and wear their seatbelt. Committee members involved in this activity were Elizabeth Bair, Daniel Baker, Tyler Heckman Lane Mergler, Cody Niswonger and Brailyn Tarcea. 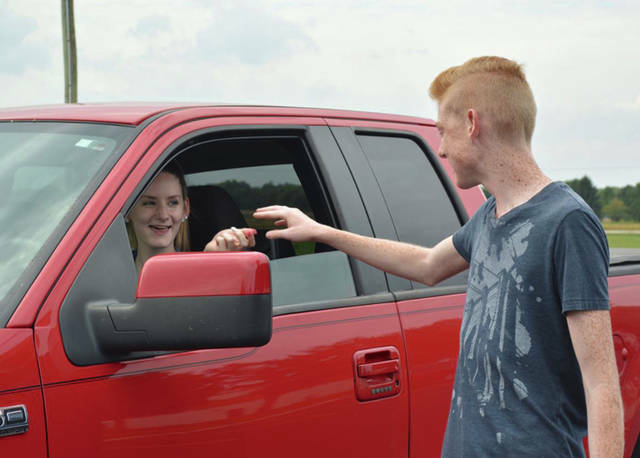 https://www.dailycall.com/wp-content/uploads/sites/30/2018/09/web1_Seat-Belt-Check-Brookelyn-Hermann-Lane-Mergler.jpgProvided photo Senior FFA member Lane Mergler, right, gives a “Life Saver” candy to senior Brookelyn Hermann for wearing her seatbelt.